Interested in a Toyota Corolla Hatchback? 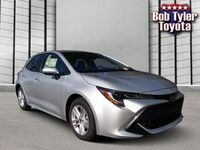 Giving you the compact size and affordable fuel economy you like from the Corolla, with the versatility and utility of a hatchback, the new 2019 Toyota Corolla Hatchback was built with city drivers in mind. Drivers throughout Pensacola and the greater Escambia County area are sure to enjoy the sporty drive and easy handling of this new vehicle. 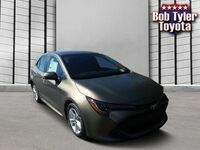 Formerly known as the Corolla iM, the versatile and spacious version of the popular Toyota compact has returned completely redesigned for 2019 known simply as the Corolla Hatchback. The 2019 Toyota Corolla Hatchback will come in two trim levels: SE and XSE. The 2019 model will also feature a new TNGA C platform, which will contribute to its comfortable drive and increased responsiveness and agility. The Corolla Hatchback will also come with a long list of impressive technologies such as the Toyota Entune 3.0 system. The next generation of Toyota’s advanced suite of safety features is here and will be available as a standard across all Corolla Hatchback models. Some of the system’s highlight features include Pre-Collision System with Pedestrian Detection, Lane Departure Alert with Steering Assist, Automatic High Beam and more. With the Corolla Hatchback, drivers have access to more room inside the cabin for both passengers and cargo. Behind its second-row seat, there are 18 ft3 of designated cargo space for your everyday gear like strollers, groceries, backpacks and more. However, should you need more space for larger items, folding down the second-row seat opens it up to a spacious 23.3ft3. 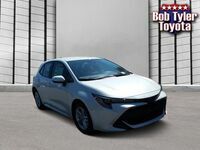 Drivers interested in getting behind the wheel of the new 2019 Toyota Corolla Hatchback will be happy to know that this versatile vehicle is now available here at Bob Tyler Toyota. Just take a moment to browse our inventory to see the models, trims, and color options currently available on our lot. From there, all you have to do is give us a call or contact us online by clicking the button below to get in touch with one of our representatives. We’ll be happy to answer any questions you may have about our available vehicle or set you up with a test drive in the model of your choice.